Want to read more of God's word? Timothy Keller and Sam Allberry sit alongside you as you open up the treasures of three enriching parts of God's Word. These inspirational readings are presented in beautiful hardback format, complete with ribbon marker and space for journaling. These 90 devotionals in John 14-17, Romans and James, taken from the Explore Quarterly range, are a great way to start reading the Bible. If you already spend time each day in God's word, this book will take you deeper in to the riches of Scripture, drawing you closer to the Lord and gaining fresh appreciation for His love for us in Christ. 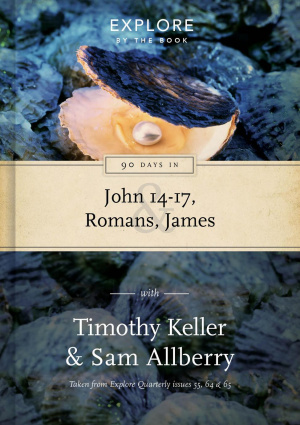 90 Days in John 14-17, Romans & James by Timothy Keller & Sam Allberry was published by The Good Book Company in January 2017 and is our 13949th best seller. The ISBN for 90 Days in John 14-17, Romans & James is 9781784981228. Be the first to review 90 Days in John 14-17, Romans & James! Got a question? No problem! Just click here to ask us about 90 Days in John 14-17, Romans & James.